Because of falling oil prices. I predicted this about two years ago. Right here. 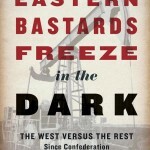 … and Ontario bounces back. With the bottoming out of the price of oil and the related low dollar, it was inevitable. And I bet the short pants in the PMO are beginning to regret their short-changing and put-downs of Canada’s most populous province. They have surely made good sport of that over the past several years. The Grit spin-dudes should have the good sense to dig up some of these clips to use in a targeted Ontario ad campaign. 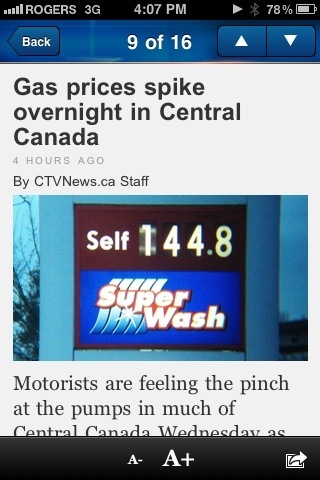 DARE to say that the Harperland economy is WEAK! They DARE! Canada’s economic growth will be the slowest among Group of 20 countries outside Europe as it grapples with a cooling housing market and as policy makers rein in deficits, according to the International Monetary Fund. The Washington-based lender cut its 2013 Canadian growth forecast to 1.5%, from an October estimate of 2%, while boosting its projections for Japanese growth to 1.6%. The U.S. economy will grow at a 1.9% pace this year, while the euro area contracts by 0.3%, the fund said Tuesday in its World Economic Outlook. This can simply not be true! Like the UN, the IMF is in the hands of socialist bastards who are hell bent on leather to discredit our Strong Conservative Majority Government at every opportunity! Do the right thing, Mr. Harper! Distance yourself as far as possible from these mohair-wearing, pipe-smoking intellectuals! You’ve done likewise with the UN and pretty much every major environmental and social organisation on the planet, so why not the IMF! I am really tiring of the growing trend of Canucks close to the border to travel to the US for the so-called Black Friday sales at the various retail Meccas (i.e., outlet malls). Seriously, not only are they forcing retailers just north of the 49th to drop their prices ahead of when they normally would in order to compete, but I really cannot see how the savings could offset the costs of getting there, eating there, etc. And don’t even get me started on the crass hyper-consumerism of this whole thing. Do your local merchants a favour and if you must shop, buck the trend and shop at home tomorrow! Oh, and a very Happy American Thanksgiving to my friends and family in the States! I’m more than a little worried about Rona being taken over by the American retail giant, Lowes. 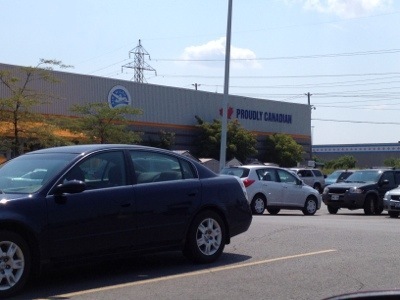 I deliberately shop at Rona for my building and repair supplies- after my local Home Hardware default shop – Because. It. Is. Canadian. Laugh all you want. Tell me that I’m a dinosaur economic nationalist. Say that in the global economy that there is no room for being sentimental about Canadian born and bred companies. I don’t care. I only shop at places like Home Depot after having exhausted all other options… doesn’t happen too often. Go ahead. Mock me. But I stand by my decisions to avoid non-Canuck shops where I can (especially Walmart – ew) and spend my $’s on homegrown businesses. I think it’s important. Those who know me will tell you that I’m not a flag in your face nationalist, but with the loss of Eatons, the American takeover of the HBC and now the complete loss of Zellers, I fear that a little spending in the favour of the red and white might be a good idea right now. What is next Canadian Tire? Else soon, short of the banks, there won’t be a Canadian store to be found anywhere in this country. … the reality for most parts of the planet. …earlier retirements? To some, this was the future as seen through the lenses of the mid 1990’s. With the Robot Master and his minions raising the possibility of changing the age at which one qualifies for OAS from 65 to 67, I cannot help but think of a course that I took while completing my M.Sc at U of G on “Leisure Management Planning”. It was based on the assumption that we were destined for EARLIER retirements and MORE leisure time. Any USRPDers want to weigh in?